Who Maintains Your Home Utilities Systems? Home | More News | Who Maintains Your Home Utilities Systems? The City of Niles Utilities Department sometimes receives questions from our customers asking if our department is responsible for fixing a problem they have with their electrical, water or sewer infrastructure or system. That's a good question to ask before you hire a contractor. You should know that some utilities companies contract with a third party company to remind their homeowners what is not covered, but the third party company will also try to sell the customer insurance to cover possible future problems. The City of Niles Utilities Department does not contract with a third party company to inform you of your responsibilities and then offer to sell you insurance. What we will do is show you what part of the system is the homeowner's responsibility and what part is our responsibility. 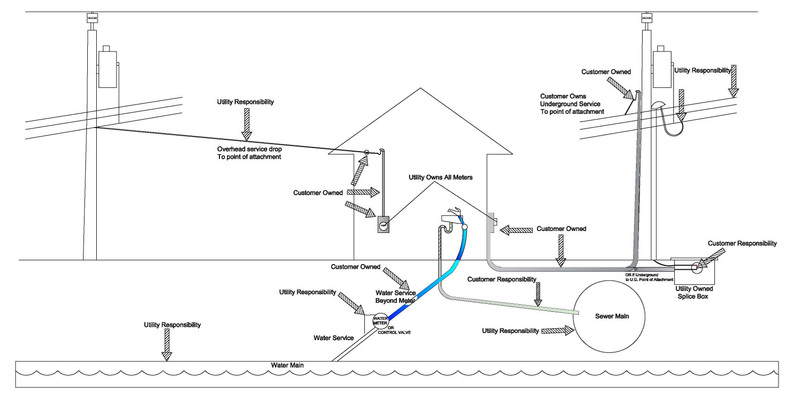 Review the diagram below to determine what portion of your electrical, water and sewer infrastructure is your responsibility and what portion is our responsibility. If you have questions, do not hesitate to call us at 269-683-4700. Or stop by our offices at 333 N. Second Street and we'll be happy to answer any questions you may have. For example, if needed, we'll send a crew to determine if there is a sewer problem on our end of the line. If it is, we'll fix it. If it's not you'll be told that too. We are your hometown utilities provider and we are here to help you.